Just as he promised, Taichi is helping Chihaya out with the Karuta club. They are now famous with the saying "all in vain". To the other students, Chihaya is wasting her beauty while Taichi is wasting his good grades with the useless club that no one was interested in. 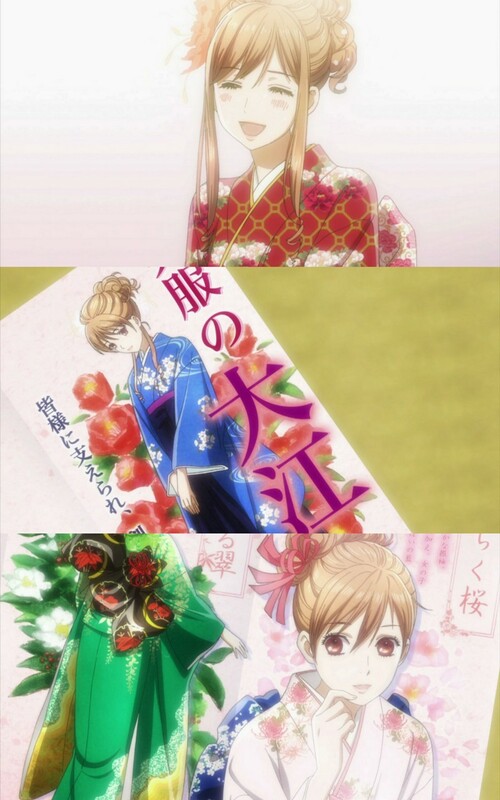 Taichi and Chihaya quickly fall back to their routines with karuta which I look forward to. I love the interaction between these two and is actually a pain reminder of what I missed with the person I give my heart for. Now that they have a place to practice, all they need now is three more members to make the club official. It just so happened that Oe Kanade, who is a pretty eccentric student who loves the Japanese culture way too much (of which her friends said that she was born in the wrong era), wants some thing that is more align with her passion. That's how she discovered the Karuta club. She was disappointed though when she learned that neither Chihaya nor Taichi wear hakama. The reason why Oe is so passionate about kimono, yukata and hakama is simply because her family owns a traditional textile shop. Because people nowadays don't give a damn about traditional clothes, the business is bad. They can't even afford a model for next year's catalog. Heh, I already know that Chihaya will volunteer for that and perhaps drag Taichi to does the same. Oe also knows the history of the poems and knows the meaning and interpretation of each poem. This made Chihaya realized how lacking her passion truly is for karuta. All she cares about is winning after all and becoming the Queen. That is why she tries hard to convince Oe to join the club, or at least teach what she knew about each poem. With such passion from Chihaya, there was no way Oe won't be affected but she has one condition if she is to join the club: she has to model for her shop (ha! didn't I tell you so) and wear hakama during karuta matches which Chihaya quickly agreed to. In the beginning of the episode, Taichi told Chihaya that she relied too much on her hearing and did not actually give some thought for the cards. Once she had her "class" with Oe, she becomes a different sort of player, as noted by Taichi. She recognized the cards by their meaning now and see each card in different color. I love how Madhouse interprets the one poem that Ayase loves so much. The animation and the narration from Oe were complimenting one another. It was totally different from the universal intrepretation that Ayase read in a book. It was more in depth and so effing romantic. Hell, even I am interested in the poems now. I thought Kanade was pretty cute. Everyone should have some sort of obsession, and old poetry and kimonos makes a good one, because it makes her more of an individual than most. So what if she doesn't like TV and modern dresses? Chihaya and Taichi do have good chemistry. I'm not ready to ship them, though, because I like Taichi more when he is suffering from a one-sided love. 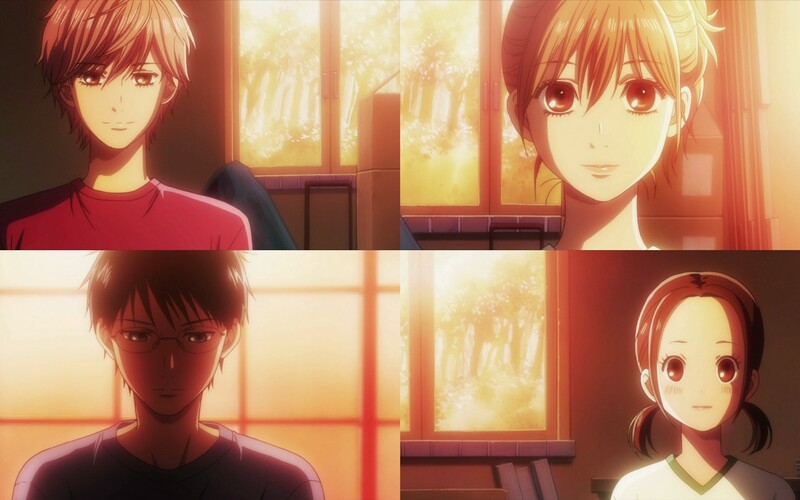 Hopefully Arata will marry that girl next door, and Chihaya will suffer through an unrequited love as well. I am sort of indifference when it comes to Kana-chan but like you said, her obsession makes her unique and definitely one of the few characters in anime that has such individualism. In fact, the same can be said for Chihaya when it comes to karuta. lol you are pretty cold and cruel wishing Chihaya's suffering. I felt the same way at the moment though. It is only fair to realize that other feelings are important too and not just her own. How come you are not shipping Chihaya/Arata?! But after the current episode, I'm kinda warming up to Taichi. Hmmm, decision, decisions! But like I said to joojoobees, if I was Chihaya and these two boys both confess their feelings, I wouldn't know who to pick either. They are two different individual which just makes it harder.